The African Union Convention for the Protection and Assistance of Internally Displaced Persons in Africa is a comprehensive document that will, if ratified, fill a void in international humanitarian law, say experts. Whereas the rights of people who flee across national boundaries are protected under the 1951 Convention Relating to the Status of Refugees and a similar instrument introduced 18 years later by the Organization of African Unity (now the African Union), there has been no international legislation catering specifically for people displaced within their own country (IDPs). IDPs vastly outnumber refugees in Africa. In just 10 of the 18 countries in east and central Africa, there are more than 10 million IDPs, according to the UN Office for the Coordination of Humanitarian Affairs (OCHA), with Sudan (four million), the Democratic Republic of Congo (2.12 million) and Somalia (1.55 million) heading the list. In the same region, there are refugees in 16 countries, totalling just less than two million, according to OCHA. This latest instrument, also known as the Kampala Convention because it was signed in the Ugandan capital, "obliges governments to recognize that IDPs have specific vulnerabilities and must be supported", said Walter Kälin, Representative of the UN Secretary-General on the Human Rights of Internally Displaced Persons. "It covers all causes of displacement, is forceful in terms of responsibility and goes beyond addressing the roles of states to those of others like the AU and non-state actors." Signed by 17 African states at the end of summit on 23 October, the convention defines IDPs broadly, irrespective of who is displacing them. According to the International Committee of the Red Cross (ICRC), the convention provides a solid framework for enhancing the protection and assistance of IDPs in Africa. The ICRC is the custodian of international humanitarian law. "The crucial challenge now is the same one facing international humanitarian law in general – ensuring that once the convention is signed and ratified by as many states as possible, it is actually implemented and respected," ICRC president Jakob Kellenberger said. "States must now take concrete steps to implement the convention into their own national legislation and regulation systems, and develop plans of action to address issues of displacement. "The convention goes further than international humanitarian law treaties in some aspects, for example, in the rules it contains on safe and voluntary return, and on access to compensation or other forms of reparation," Kellenberger added. 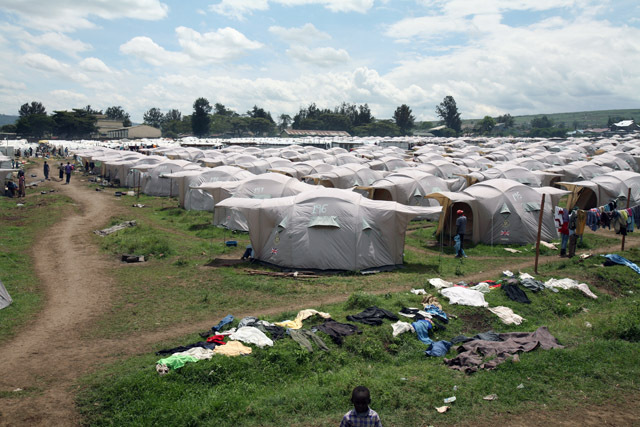 A view of Nakuru IDP camp, April 2008. At least 350,000 were displaced during the post election violence in Kenya, which also claimed the lives of more than 1,200 people. To become a binding document, the convention has to be ratified by 15 of the AU's 53 member states. "No international treaty is perfect, and the AU IDP Convention does have a few weaknesses. Concerns over the lack of effective enforcement mechanisms and insufficient guarantees for equality and non-discrimination have been raised," the Brookings-Bern Project on Internal Displacement noted in a statement. "There is some question regarding the extent to which non-state actors and armed groups called upon by the convention to protect IDPs can be bound by its provisions. Nevertheless, the convention, which has benefited from the input of international experts, is considered to be generally consistent with international standards such as the Guiding Principles on Internal Displacement." AU officials in Kampala were cautiously upbeat, urging member states to remain engaged. "It is the responsibility of member states that the convention becomes a binding instrument," Jean Ping, AU Commission President, said. "At this point, it is an achievement, but not an end in itself." Zambian president Rupiah Banda also chose his words carefully. "We have given legal force to the task ahead and Zambia is ready to sign," he said. "Those who are displaced should not be forgotten." An observer who requested anonymity said progress would require member states to demonstrate greater political will to implement the convention and address concerns about sovereignty and enforcement. "It is a question of a progressive [AU] Commission versus [conservative] member states," he told IRIN in Kampala. "For example, the inclusion of armed groups in the draft was interpreted by some member states as lending legitimacy to such groups." The convention emphasizes the sovereignty of member states but spells out the obligations and responsibilities of armed groups. Among others, it prohibits armed groups from carrying our arbitrary displacement, recruiting children and impeding humanitarian assistance. "Overall, though, the convention has a good chance of getting the necessary signatures rather quickly," the observer added. "In April, SADC’s [Southern African Development Community] 11 members committed to speedy signature." Civil society leaders, attending a parallel event, insisted political will and demonstrated commitment were key to progress. The fact that only five top officials came to Kampala, they said, called for an urgent strategy to bring on board more states. Present were Banda, Ugandan President and host, Yoweri Museveni, Zimbabwe's Robert Mugabe, Somalia's Sheikh Sharif Sheikh Ahmed and Mohamed Abdelaziz of the AU-recognized Saharawi, along with high-level UN, INGO and AU delegations. "It is one thing to have a good convention and another to implement it," Dismas Nkunda of the New York-based International Refugee Rights Initiative told IRIN. In 2007, the AU adopted the African Charter on democracy, elections and governanc e, but it has so far been ratified by only two member states. The basic question of impunity also needed to be addressed. Until African countries learn to respect the law, participants said, the continent would "remain at rock bottom" in its attempts to address the problems of the displaced. AU officials seemed conscious of these sentiments. "We have come a long way, but a plan of action is now envisaged," Jolly Joiner, AU commissioner for political affairs, told IRIN. "Once member states are on board, we will take this convention forward." Antonio Guterres, head of the UN Refugee Agency (UNHCR) and representative of the UN Secretary-General at the summit, said solving the question of displacement in Africa required political solutions. "There is no humanitarian solution to conflict," he explained. "The solution is always political."